Purchase our exclusive bag for $25 and on the 5th Saturday everything that fits in the bag is 20% off! It's like having your very own special sale! Bonus! Use the bag for your everyday shopping at SLH and be entered to win in our monthly drawing! Come join us as we make this fantastic folio. It is crammed full of pockets for all your project needs! This folio features multiple size pockets perfect for storing all the parts and pieces for almost any project all in one place! 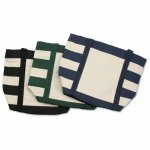 Pretty & Practical, these zippered bags with side loop handles are quick and easy to make. Soft & stable gives them great body and stability! 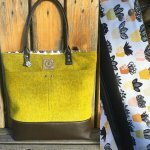 Bags can be made in 3 sizes! 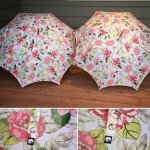 Make a custom umbrella to match your favorite coat, rain boots, or bag. We will make this umbrella with cotton fabric and use waterproofing spray to make it rainproof. The Waterlily is a large sized tote that can be made in waxed canvas, cork, vinyl, regular cotton fabric or a combination of these materials. It has one exterior zippered pocket hidden under a small flap, and 2 large slip pockets on the back. It has 2 top carry handles and one removable adjustable strap. The interior of the bag has a zippered main closure, one interior zippered pocket and 3 interior slip pockets. Join Enjoli & Abby to make this fun and super popular English Paper Pieced project! Whether you're fussy cutting (like E&A) or just using your favorite fabrics, these blocks come out super cute. We'll work through the various shapes and give you tips/tricks for success with EPP, plus learn both thread and glue basting techniques! Feel free to come work on any other EPP projects you might have too! This class is designed for kiddo(s) and their Grown Up to come sew, have fun and enjoy an afternoon with others. Bring whatever you're working on, a snack to share and join Enjoli and Alia for a fun afternoon of sewing! Want to quilt your own quilt? The SLH Guided Rental program will help you complete your own quilts, while having a guide on hand to troubleshoot and assist with basic set up. Want a Batik fix every month?! Join our monthly club to get, not one, but TWO beautiful Batik Bundles every month for a whole year! Each month will include an 1895 Bundle AND a Bali Chop Bundle! We guaranteed you?ll love every month! Join Kim for a Saturday filled with sewing and laughing and of course eating! Bring your project and sew your day away! This class is designed for Beginner to Intermediate paper piecers. You may bring ANY paper piecing pattern with you to work on. Even if you?ve never paper pieced before you may join us! I will go over the basics of paper piecing as well as show some tips and tricks you can use on more advanced patterns! April project is "Banana Quilt" from the book "Perfect 10 Quilts". Join Marcia for this once a month fun sewing day! Breakfast club is the place for all things fiber! Bring a breakfast/lunch dish to share and join the quilters for a fun day of sewing. Doors open at 8:30am. We'll have the coffee on! June project is "Neapolitan" quilt from the Perfect 10 book. Join Marcia for this once a month fun sewing day! Breakfast club is the place for all things fiber! Bring a breakfast/lunch dish to share and join the quilters for a fun day of sewing. Doors open at 8:30am. We'll have the coffee on! May project is "Glow" pattern from It's Sew Emma. Join Marcia for this once a month fun sewing day! Breakfast club is the place for all things fiber! Bring a breakfast/lunch dish to share and join the quilters for a fun day of sewing. Doors open at 8:30am. We'll have the coffee on! Brown Bag Mystery Quilt revealed on Sunday, May 12 1-3pm! We will have an unveiling party with snacks! This is the opportunity to see all of the other mystery quilts! They do not need to be quilted and this is free to everyone! Learn the magic and experience the fun of creating a beautiful and unique quilt using only one fabric. You will learn about fabric repeats, 1/4? 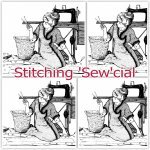 seam allowance, strip piecing, choosing contrasting/enhancing fabrics to compliment your focal fabric and the basis use of rotary cutters and rulers. Join fellow strippers once a month for camaraderie and fun! Receive a FREE pattern, be the first to see club quilts revealed, earn Club Cash to spend any way you want! Put it on your calendar and then casually mention it to your coworkers!! I dare you! Always the first Tuesday of the month at 6pm. Bring your hand embroidery project (or Fresh Cut BOM) and learn some new techniques with friends.